AlbumArtWallpaper.com is now TiledWallpaper.com - with video game and movie covers on top of the awesome album art! Thanks for visiting! 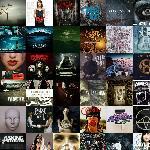 Create your own background wallpaper image using album cover art, DVD movie covers, and video game covers. Make your own desktop background image by entering the album names, movie names, or game names you want to include on your new background, and the artwork will be automatically added for you! Each album, movie, or game that you add is repeated to make a tiled or slightly mosaic image. There are different settings to play with, so you can make your next background image very unique. Check out the latest user-made wallpapers below, read the quick tutorial, or go straight to the Albums, Games, or Movies page to start making your own wallpaper.